Rosie’s rosey room – decorating my daughter’s nursery. It’s no secret that I love to shop. With my mum, with my girlfriends, with my baby daughter, alone. But I like to see myself as a discerning buyer. I don’t shop for the sake of it. I justify every purchase. Is it functional? Is there room for it? Can I live without it? It may be a secret that I love vintage roses. Maybe not (my daughter’s nickname is Rosie, people!). The collection/obsession began when I was a very young child, and I adored my paternal grandmother’s original 1960s Royal Albert Old Country Roses china dining setting. When Nanna passed away, I was still a child and she bestowed her setting upon me. My mother has been its custodian ever since. It’s displayed in her home and comes out for special occasions. In the future (when my children are less like proverbial bulls in china shops), it will take pride of place in my own home. 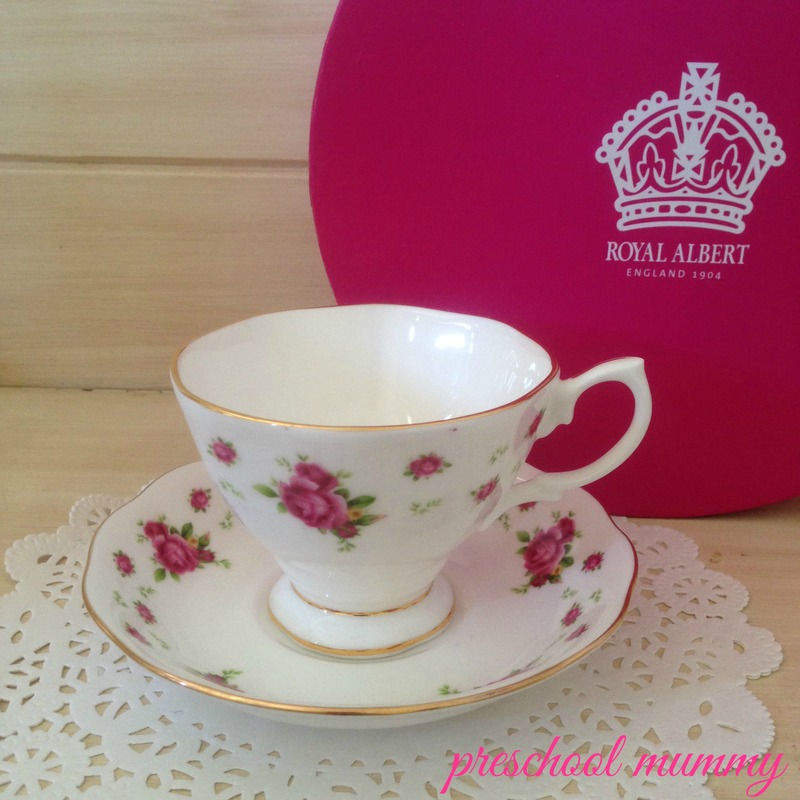 Rosie’s own Royal Albert collection has begun with this gorgeous Christening gift from a dear friend. Until then, I satisfy my rose obsession by decorating my daughter’s room in vintage rose style. I couldn’t resist buying her this sweet Kate Finn horse for her first Christmas last year. Years ago, when I was pregnant with our first child, I bought this lovely cushion at Mama’s Home in Windsor. It was functional, and so pretty that I couldn’t live without it. Criteria satisfied! That baby turned out to be a boy in the end, and so did the next one, and so the predominantly petal-pink cushion was protected in the nursery wardrobe. Then Rosie arrived. I set upon a mission to find fabric to match that cushion. I wanted Rosie’s nursery setting to match, because I absolutely loved the fabric. I searched for months in craft chain stores, small fabric carriers, online (there are search engines for fabrics! Who knew? )… everywhere. But my day was about to get even better! Inside the store I discovered that the Monsoon also came in a cot set, with a quilted fit quilt cover and toddler pillow case! I brought that baby home and promptly whipped it on the cot, and was thrilled to discover that it tied in so well with my Red Plum Linen cot sheet set, and my broiderie anglaise cot valance. Yay! What I especially love about Adair’s Kids range and stores is that the designs are youthful, yet elegant. I love that the patterns are understated yet fun. And you can also shop online, which every mother of young kids will appreciate is a great option! I love that I can use this piece as a quilt cover with a cot quilt inserted for extra warmth in the winter, and then whip out the insert (bought separately) in summer, using the piece as a coverlet, which will be more lightweight. Years ago I made a pact with myself regarding tacky kids linen. I have stuck by my “No licensed character” rule, but sometimes it’s been difficult (there is soooo much gaudy linen out there in the department stores!). *I have made an exception for sleeping bags. Because holidays are meant to be fun. And daggy. I’m actually keen on some new linen for my boys’ room which is currently undergoing a makeover. They’re all about Disney Planes at the moment and as much as I love Dusty Crophopper, I do not want to see his fake-tanned orange face (complete with creepy propeller-moustache) peering at me from my kids beds in the dark of night. We’ve reached a compromise we are all happy with. My vintage love affair meets their aviation interest in a classic WW1 neutral and navy biplane themed room. So, anyway, that was my epic shopping win for 2014. Thrilled, to say the least. What’s your best shopping win this year? Maybe a bargain? Maybe something hard to find? Maybe an expensive treat you’ve always wanted? Previous Post In space no one can hear you scream. But four other people live in our house, so stop screaming. Next Post Conversations With Strangers: The first-date question that changed my life. I love the Adairs kids range. Heck I love all their linen range! They’re really fantastic, Bec and so lovely in- store too. What beautiful items! Rosie is a lucky little lady to have such precious things. I’ve also avoided licensed bed linen (other than a few spares given as gifts) but am yet to purchase from adairs! So cute!! You so have to post pics of the room when it’s finished!!! 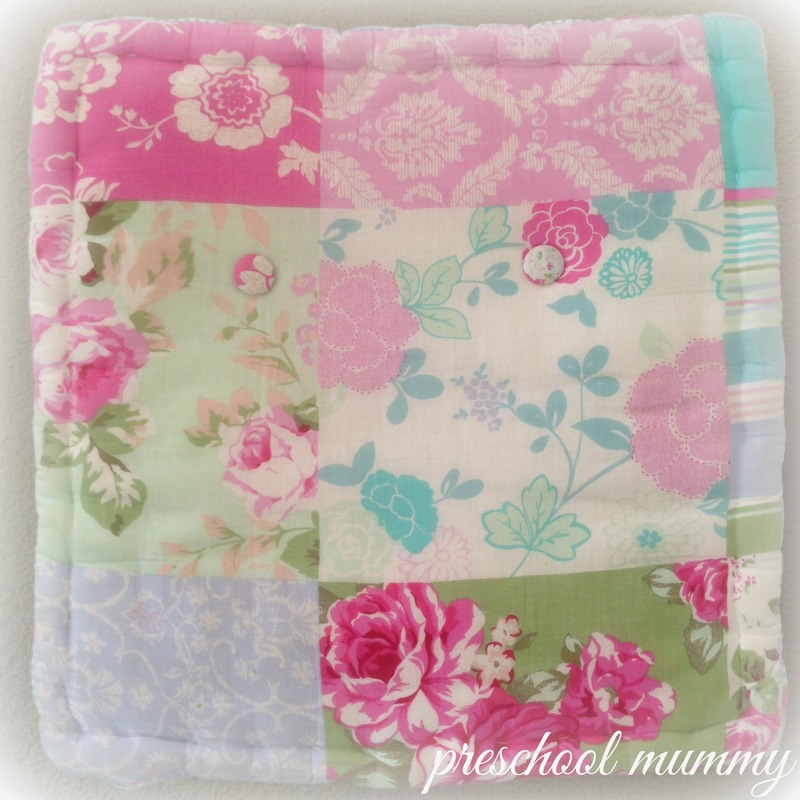 What perfect linen for your Rosie!! You’ve inspired me to try to resist the licenced characters for baby number three. Love your style! My Miss 3’s room is done in Cath Kidston floral and spots, I’m a fellow vintage and floral lover. Can’t wait to see the end result of Rosie’s room! I only buy bargains! Can’t bring myself to buy anything else. Love that you found something you loved. It’s just the best feeling. Thanks for visiting, Jess! I love finding treasure! So beautiful and pretty! !!! I love the Kate Finn horse! Really cute! Yes I love it too ! X thanks for stopping by! What a lucky little lady she is – just gorgeous! You’ve done well! It’s so much fun making a pretty nursery isn’t it?! 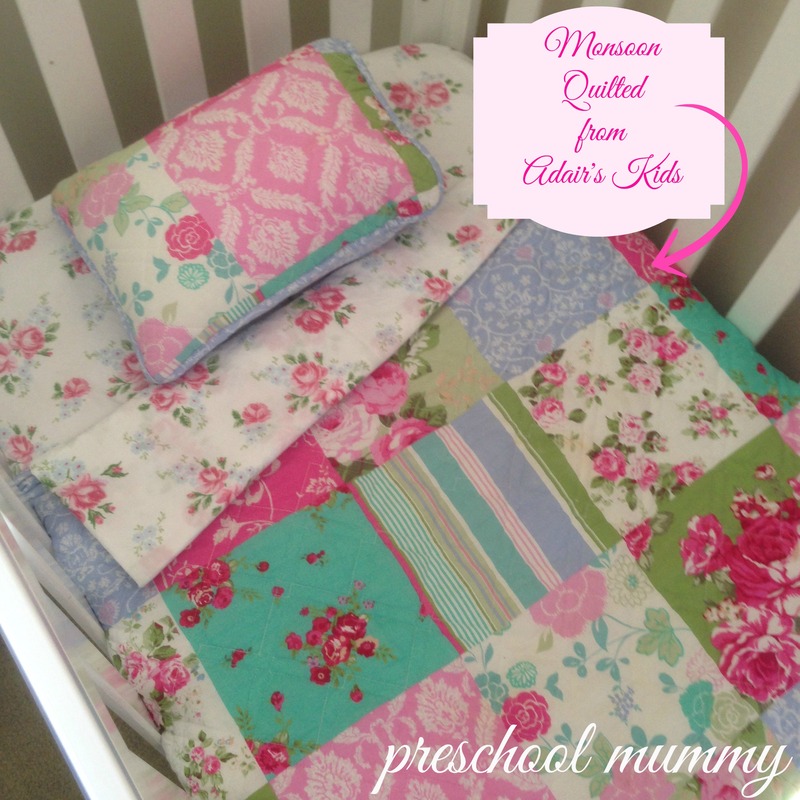 I love that adairs quilt cover you chose, so pretty! 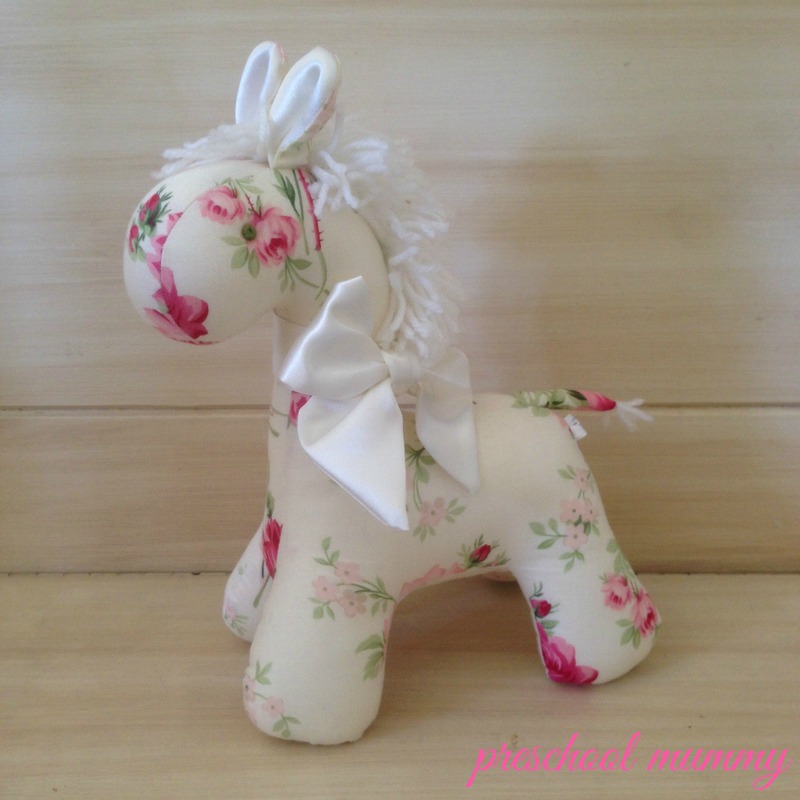 Are you going to put the rose rocking horse in the nursery too? I have a thing for roses too they are just so classic, timeless, elegant and beautiful! You have found some really great stuff! Rosie is a really lucky gal! I love Adairs Kids too – although there are times where I find their products a lil too pricey for my liking – love it when their stuff goes on sale though! Lovely, Lisa! Which ones did you choose?